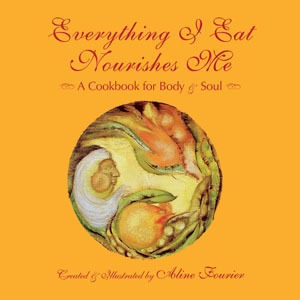 In Everything I Eat Nourishes Me, A Cookbook for Body & Soul, Aline Fourier has gathered a multicultural collection of recipes and rich stories about dishes we love to create. Eating becomes a journey of nourishment, as we learn about our connections to the foods we eat – our feelings, thoughts, and memories. We are the alchemists of our bodies in this colorfully creative and empowering approach to cooking and eating. Recipes run the gamut from the sweetness of a sugar cookie made by a great-grandmother, a Holocaust survivor, to the ancient secrets of an Armenian specialty called “yalanchi” (stuffed grape leaves). A Cuban chef, who paddled over on a tire, shares vivid recollections of his native cuisine. Interwoven with original artwork, photography and intimate narratives, Fourier creates a gastronomic experience that engages us in contemplating our personal relationship with food and nourishment. The cookbook’s underlying premise, that thoughts, feelings and personal memories associated with the dishes we create and eat are ingested with the food itself, expands the definition of “nourishment” from nutrition to sustenance. This encourages us to depart from what is trendy and politically correct advice about food, and allows curiosity, joy, pleasurable memories and loving thoughts to guide our food choices. Everything I Eat Nourishes Me combines all of the above into an artistic whole that recalls the culinary customs of our ancestors worldwide, empowers readers to take charge of their nourishment, and offers a balanced approach to a future of good health.